Thank you for exploring Heartful Art online. You are what it's all about. In addition to original paintings and prints, Heartful Art offers motivational art to inspire excellence and success in business, support individuals in living fulfilling lives, encourage health and healing, and facilitate heart-centered communication. Although we now have over a thousand products available for purchase on-line, Raphaella is a prolific artist and writer. Many options are available to you that are not reflected here. 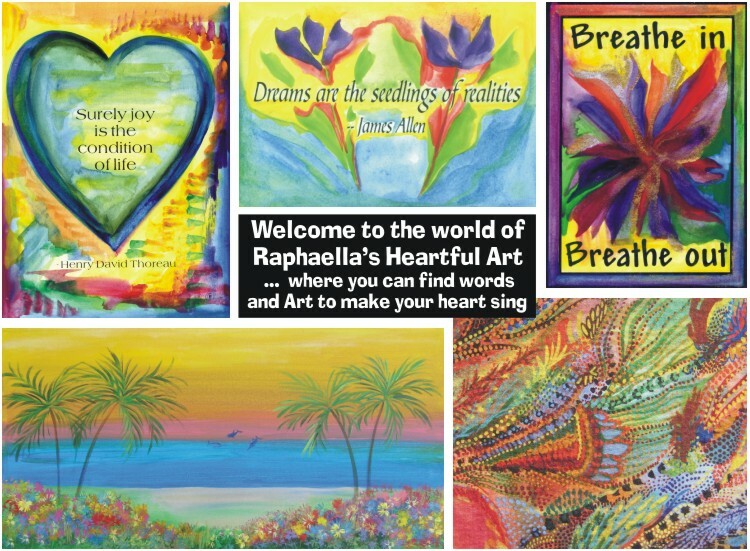 We are continually updating and adding more of Raphaella's art, and new originals are created all the time. Please don't hesitate to contact us if you don't see what you're looking for, or if you have ANY trouble at all on our website. Call 941.993.7001, fax us at 941.237.3944, or e-mail Raphaella at web-rv@heartfulart.com.